There's nothing like winter water and particularly Niagara water, full of those minerals so that it is very green. 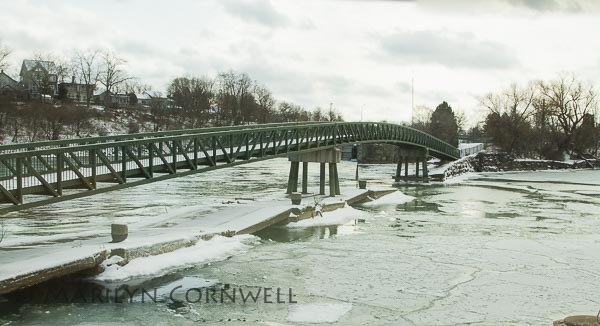 Port Dalhousie recognized this and painted the walk way bridge a matching green. This is the scene of our first picture. From inside Pier 61, our favourite restaurant in Port Dalhousie that sits on the bank of the old Welland Canal entrance (I think). The water is Twelve Mile Creek flowing into the Lake. 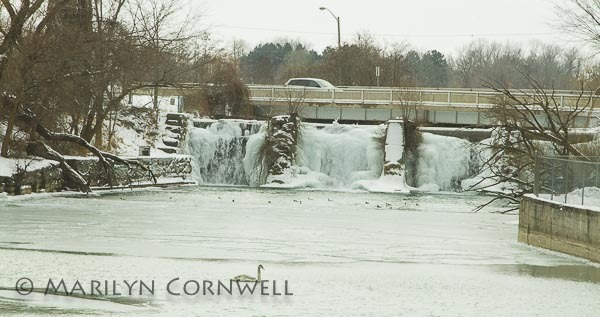 The second picture shows the bridge that crosses over the small, almost frozen falls. This is the one road into Port Dalhousie, and there's one road out. Perhaps that is what makes it such a quaint little seaside town still. We were lucky yesterday as there was a pair of swans that came through for a while. Our third picture shows at all the people fishing on the other side of the water. We haven't seen this many people since before Christmas. I wondered if there was a fishing contest or festival. 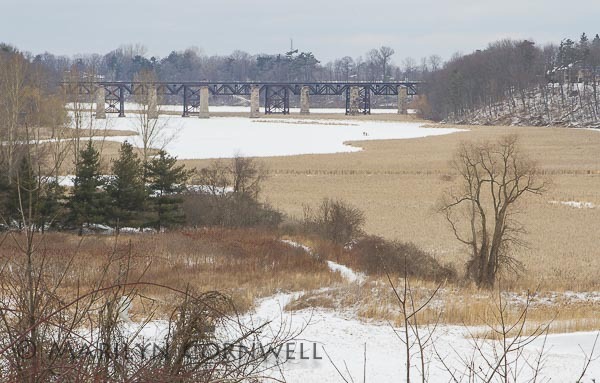 Our final picture today is what I think of as the backside of Jordan Harbour Bridge. The frontside view is from the QEW. It is such a scenic view with the massive Jordan Valley in the foreground. I haven't been able to get to the eastern side to take photos. Houses line both sides and the roads in are private - all the way from the main north/south road. I did find this empty lot with a for sale sign. What a view this monster house will have as it joins its fellows on the east bank of the Jordan Valley.